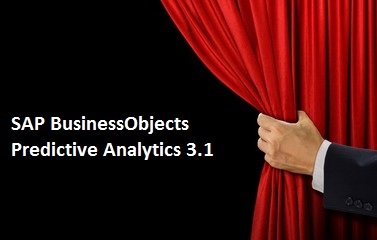 Announcing SAP BusinessObjects Predictive Analytics 3.1! On behalf of the entire team, it is with great pleasure that we announce the general availability of SAP BusinessObjects Predictive Analytics 3.1! 😀 Existing customers can immediately download the latest version from SAP Service Marketplace. If you are not an existing customer, head here to download the latest 30-day trial of the desktop modeling component of the suite. Wait a minute – did I just say “suite” and not “tool”? Yes! SAP BusinessObjects Predictive Analytics has always been more than an easy-to-use predictive modeling environment – it is first and foremost an end-to-end machine learning platform that encompasses the full predictive lifecycle from initial dataset creation to creating models and most importantly, all the way to the ongoing administration, maintenance, and operationalization of predictive models into production. It is this unending model management of the hundreds or even thousands of predictive models that ensures you are using are the most accurate and robust models at any given time – to do otherwise simply comprises the results, and by extension, the business value of those results. However without an automated model management platform, this is very much a manual effort by highly trained humans and we would rather they focus on solving new business problems rather than validating solutions to existing ones. Therefore it is important to remember that when you use our desktop modeling environment, you are using the most visible, yet not necessarily the most important part of the suite. A major emphasis of our version 3.0 (which we released at SAPPHIRE 2016) was reimagining the Model Manager component of the suite as the new Predictive Factory. This brought us a new platform, a new look and feel, and new features for what is arguably the least glamorous but most important part of the predictive process. While I won’t cover the details here, I strongly encourage you to learn more about the new Predictive Factory in 3.0. If version 3.0 was so awesome, how could we possibly improve on it in 3.1? Well, 3.0 was only the first step in a multi-release strategy to deliver the next generation of predictive analytics to our customers. Version 3.1 is very much a customer-driven release and based on feedback from many customers, we focused on increasing the suite’s automation and operationalization capabilities. Predictive Factory (and Model Manager before it) has always been able to control the lifecycle of predictive models using our automated algorithms, but this new release also supports the more complex custom models you can create within Expert Analytics. Now, for the first time ever, advanced users creating predictive models with any combination of SAP HANA PAL, SAP HANA APL, and open-source R algorithms can use the Predictive Factory to automate many of their tedious and repetitive workflows without sacrificing the ultimate flexibility of being able to use any predictive technology they want. In addition to being able to consolidate and standardize model operationalization processes for all types of models, they can be all be tested and retuned automatically based on schedule or even by an event-basis. After all, let’s face it – we all want to work on new and higher value activities than retesting and reapplying models on problems we have already solved, don’t we? Previous versions of Predictive Analytics have always had the ability to generate scoring functions in everything from vendor-specific SQL to automatically generated C/C++ and even Java code, but version 3.1 introduces the ability to create SAP HANA User Defined Function (UDF) SQLScript out of your generated model. Now embedding predictive capabilities into almost any application that uses SAP HANA (including those running on top of SAP HANA) is as simple as embedding the exported UDF into your Calculation Views. Have SAP BW on HANA? You can now train models on your HANA-based data and embed the resulting predictive calculations directly back into your BW system. Have another application that uses SAP HANA (i.e. S/4HANA)? Same deal. This seamless integration is key to bringing the benefits of predictive analytics to any user. Customers using Spark-based platforms have not one or even two ways of leveraging their Big Data environments, but three. You can still use SparkSQL (as can pretty much any other predictive tool in the market) or SAP’s own Native Spark Modeling (which we introduced in SAP PA 2.5), but in 3.1 you can also create automated models and generate Vora-compatible SQL. Why so many different methods? Choice. Native Spark Modeling (NSM) enables the delegation and distribution of predictive calculations across your Spark cluster. NSM is included with SAP BusinessObjects Predictive Analytics and works completely transparently and seamlessly without any additional licensing. For customers who have a combined SAP HANA and Big Data strategy, SAP HANA Vora is a critical bridge that enables the benefits of native in-memory processing while still taking advantage of the cost and scale of Hadoop. With 3.1’s support for SAP HANA Vora, you can be assured that Predictive Analytics will perform optimally regardless of your Big Data strategy – now, and later. 2017: There’s More in Store! As I said above, we are executing on a multi-release strategy to reimagine not only SAP BusinessObjects Predictive Analytics, but how businesses use predictive analytics overall. The “heavy lifting” of a new interface and new platform is mostly behind us and we are back on the aggressive innovation pace we had last year (I should note that while 2015 had five releases, we still will continue 2016’s cadence of two releases a year in 2017 to minimize customer disruption). The authoritative source of what’s coming next is the Official Product Roadmap. While our lawyers give us some strict rules on what we can say about the future (ironic given the product is Predictive Analytics! ), our stated strategy of re-imagining the predictive experience has not changed and you will see elements of that in our roadmap and upcoming previews and betas of version 3.2. If you are an existing customer, you want to check out Predictive Analytics 3.1 now as it brings some of the most requested improvements and fixes over the last year into this release. There might even be a few things “under the covers” that will give you a taste of what’s coming in the future. (Hint: Keep an eye out for more information in the new year 😀). If you haven’t tried SAP BusinessObjects Predictive Analytics yet, there has never been a better time. Check out this video for a quick primer. The time for intelligent and automated predictive analytics to take over from the traditional “data science” way of coding and scripting is almost here – it just so happens we’ve spent literally hundreds of thousands of engineering and data scientist hours over the last 18 years innovating and refining this supposedly “new” topic (and we’re pretty good at it). Finally, keep an eye out on the Predictive SCN for more details as well as articles on all the new features written directly by the product managers themselves. I would also recommend that you sign up for our SAP BusinessObjects Predictive Analytics Newsletter to make sure you are in the loop. Again, if haven’t checked out SAP BusinessObjects Predictive Analytics yet, there has never been a better time (click here for our free 30-day trial of the modeler). Will you be able to provide more insights into using HANA capabilities for training and validating models ? If I connect to HANA database as a source in my desktop SAP PA modeling tool( I have enabled delegation as well) will the training and validation of data happen in HANA or on SAP PA server /local machine ?